It is possible to create a deformation chain that splits into multiple branches, allowing to rig complex drawings with multiple extremities using a single deformation chain. When creating a split deformation chain, a Deformation Composite layer is automatically added to your rig. This deformation composite connects all the branches of the split deformation chain to the drawing it deforms. You can see which deformation layers are connected to the Deformation Composite in the Additional Links column of the Timeline view,. Select the drawing layer or the deformation chain to which you want to add a branch. NOTEWhen using the Rigging tool, you can select which existing deformation point you want the next deformation point you create to branch from at any time by selecting a point in the Camera view. When you create a deformation point, it is always linked to the currently selected point, if any. 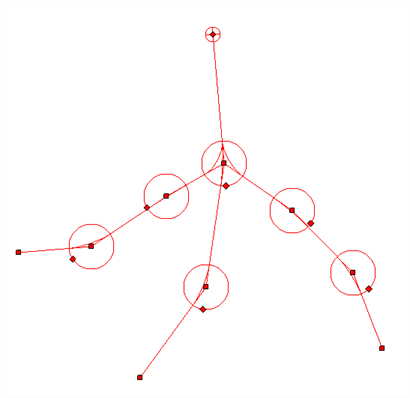 Creating a point automatically selects it, which is why deformations are built in a single chain by default.